Laser pulses emitted from a lidar system reflect from objects both on and above the ground surface: vegetation, buildings, bridges, and so on. One emitted laser pulse can return to the lidar sensor as one or many returns. Any emitted laser pulse that encounters multiple reflection surfaces as it travels toward the ground is split into as many returns as there are reflective surfaces. The first returned laser pulse is the most significant return and will be associated with the highest feature in the landscape like a treetop or the top of a building. The first return can also represent the ground, in which case only one return will be detected by the lidar system. Multiple returns are capable of detecting the elevations of several objects within the laser footprint of an outgoing laser pulse. The intermediate returns, in general, are used for vegetation structure, and the last return for bare-earth terrain models. The last return will not always be from a ground return. For example, consider a case where a pulse hits a thick branch on its way to the ground and the pulse does not actually reach the ground. In this case, the last return is not from the ground but from the branch that reflected the entire laser pulse. The picture below from Fernandez-Diaz (2011) might help complementing Aaron's answer. Lidar returns are discrete observations* recorded when a laser pulse is intercepted and reflected by targets. Multiple returns derive from one laser pulse intercepting multiple targets (e.g. a top of a tree, its branches, and the ground). *such as coordinates x, y and z; intensity of laser reflectance; scanning angle, among others possible . discrete return lidar returns multiple measurements from a pulse, but are not tied to the specific pulse. Whereas, waveform lidar represents multiple binned measurements associated with each pulse. The waveform data allows one to derive a continuous distribution of the laser energy for each pulse where discrete return does not. Fernandez-Diaz, J. C. (2011). 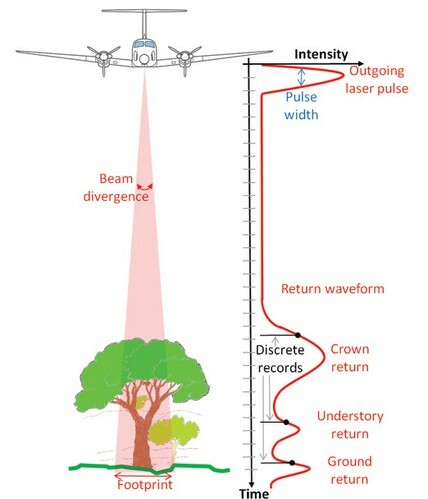 Lifting the Canopy Veil - Airborne LiDAR for Archeology of Forested Areas. Imaging Notes, 26(2). Not the answer you're looking for? Browse other questions tagged remote-sensing lidar terminology or ask your own question. How exactly does a single laser pulse from LiDAR act? Maximum number of returns per laser pulse in airborne LiDAR? Removing incorrect (non-ground) points from LiDAR data?